You know how it goes. You’re just minding your own business, saving some people with your telekinetic mutant powers. Then, out of nowhere, you find out that you’re the host for the Phoenix Force, one of the most powerful entities in the entire universe. Alright, so maybe that doesn’t happen to you on your average day here on Earth. But that’s because Jean Grey is kind of a big deal. She was the undeniable powerhouse of the X-Men for many years and she’s single-handedly defeated a bevy of different supervillains. It’s really no wonder that the Phoenix Force chose her as the successor to its power. Do you think you’re ready to wield the Phoenix Force? Are you a big deal, just like Jean Grey? Well, then it’s time for you to slip into this officially licensed X-Men costume to prove it! This Jean Grey Phoenix costume faithfully recreates her look from the Marvel comics. It comes with the green, form-fitting bodysuit, which has a gold Phoenix emblem on the front. It also comes with a pair of shimmering gold boot tops that you can wear over your favorite pair of heels. The matching gold gloves give your hands a heroic look and the matching gold waist sash cinches the look, making you feel like a fierce comic book superhero. Get your telekinetic powers warmed up (if you have them)! 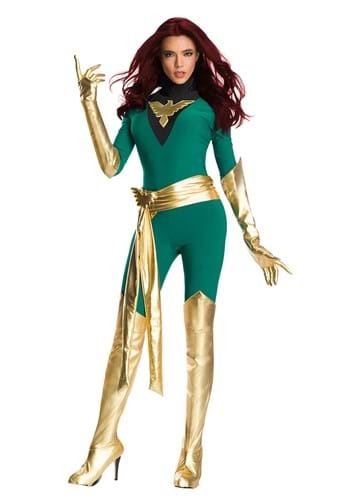 This officially licensed Jean Grey costume will have you ready to save the world solo, or with a team of your friends. If you’re trying to gather up your own group of superheroes, try checking out our full selection of X-Men costumes to bring together a team. You’ll be ready to take down any villainous threat that crosses your path! It looks great online but it is just ok in person. I usually take a size small and before ordering this, there were no measurements to be able to determine the dimensions - I even contacted customer service to inquire. I was told that because the costume is fairly new, they didn't have anyone doing the measurements yet. My measurements are 35" bust, 26"waist, and 36" hips. Since I tried it on, the return policy doesn't allow for any returns, so I am having it altered at my expense. I was swimming in this body suit. It was made for someone with a few extra pounds than I. It is especially loose in the arms and under the arms. The boot covers slide down, the gloves are baggy, and the waist and legs are also baggy (like pajamas). It only fits ok in the bust. It is clearly geared towards typical American sizes. The sash is a little loose but not too bad since it sits on the hips. The body suit material is rather thin and also see through. I recommend wearing another body suit underneath and choosing undergarments wisely. I also should mention that it has a few loose/dangling threads which give me the impression that this costume was sewn in a hurried fashion. When I went to my seamstress and she was folding over the gold material to pin it, it cracked very easily. I don't really feel it was worth what I paid even with my first timer's discount. However, I am just going to work with it. This costume had great potential, however, the fitting of the catsuit itself was extremely poor. I own more than a handful of premium level costumes, and this one by far was the biggest disappointment, which appears to be a manufacturing issue since this is a relatively new costume. Would recommend the manufacturer to revisit their efficiency and quality processes. - Ill-fitting all around, the fabric does not have enough elasticity nor is high-quality fabric. Loose around arms, the cut was not of premium levels. OVERALL COMMENTS, from someone who loves Cosplay - Buy this on (super) sale, if you need to, not work the 90$ investment. Don't do it. Hello! Thank you for your input on the costume. I do apologize if it did not seem to fit you, and did not meet your expectations. In looking at your order information, it seems that you did not reach out to us for help with any concerns you had about the sizing or quality of the costume. We have a great exchange program, and could have sent a replacement order for the same costume in a different size, another costume of your choice, or simply refunded the order in full on return with a pre-paid return label sent at no charge to you. For future reference, you can always contact our customer service department, as we are very customer friendly and available through phones, chat and e-mail to attempt to resolve any issues.